The Cap Corse peninsula is less visited than many parts of Corsica and as a result has retained a peaceful, laid back tranquility. It is a mix of small villages and harbours, a few beaches and rugged hills inland of the coast. Up the eastern side we have the villages of Macinaggio and Rogliano with Barcaggio at the tip. 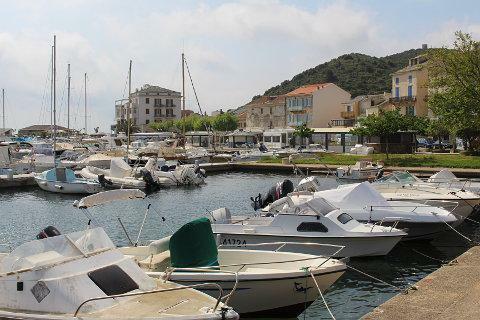 Just inland of Barcaggio is Ersa and down the western side the picturesque harbour of Centuri. Macinaggio is a small village with a harbour and looks out onto some small islands in the sea. 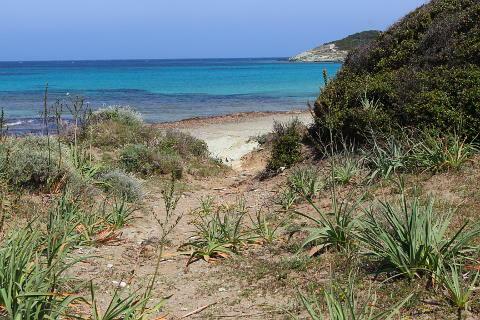 It has a beach but this is often covered in the posidonia leaves that cover many beaches in Corsica. The dead leaves are washed onto the beaches and form thick cushions of leaves. Whilst not looking great and in places making it hard to find a sandy spot they do protect the coastline. There is a sandy beach a couple of kilometers to the north. There is also a coastal walk that you can do - the Sentier Douanier. A little further north and a few kilometers inland and you get to the tranquil village of Rogliano. Rogliano sits on a hill covered in olive trees and as you approach the views of the hills and the town, and of the view over to the sea is stunning. 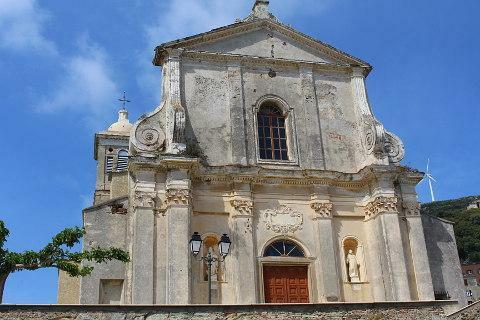 In the centre of the village are two churches and a genoese tower. There is also a hotel and restaurant if you are looking to have lunch. Or sit on the church wall and have a picnic whilst admiring the views. Further up the village is a convent and three ruined castle. Rogliano is in fact made up of several hamlets. Apparently Empress Eugenie was forced to stop here in 1869 due to bad weather on her way home in her yacht from the ceremony to open the Suez Canal. She had to walk 3km up a goat track to get to Rogliano but was warmly welcomed and in return paid for a road to be built to the village. For me the highlight of this section of Cap Corse was at the tip of the peninsula at Barcaggio. Barcaggio is just a few houses but has a great beach. 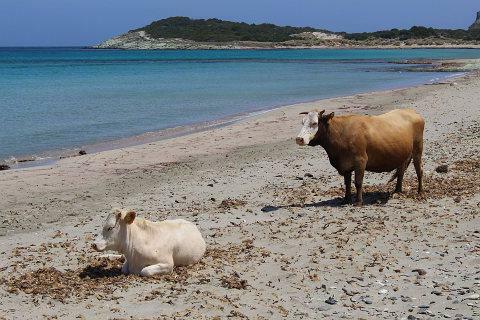 It is sandy with not too much seaweed and enhanced by the regular presence of cows on the beach! 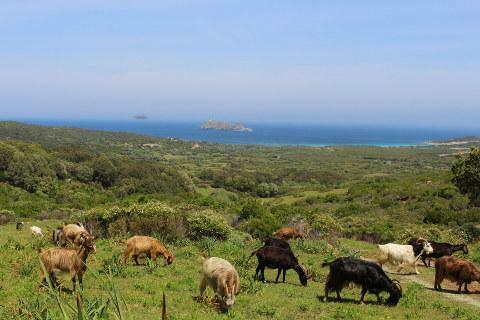 As we approached the beach car park we passed a troup of goats and indeed this is one of the pleasures of driving round Corsica. We regularly found groups of pigs, cows or goats on the roads or the verges next to the roads or walking along the footpaths. Nature really is very close! The sea on Barcaggio bay is very shallow and ranges in colour from pale blue, to turquiose to dark blue. The rocky edges to the beach and the small island in the sea with a tower on it all add to the general prettiness of the beach. 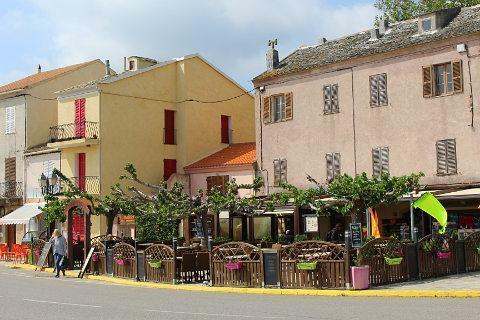 Visit the quiet villages of Ersa at the tip of the peninsula. Nonza is a pretty village on the east of the peninsula whilst Centuri is a picturesque harbour on the western coast.